April 23rd sees the arrival of the British Asparagus Season and I can't wait! Like most fruit and veg nowadays, asparagus is available throughout the year in most supermarkets, however I always look forward to the fairly short season (which runs through until Midsummer in July) when the fresh, crisp asparagus is plentiful and affordable. At this time of year you will notice that spring menus start to feature asparagus inspired starters. From a simple poached egg with griddled asparagus soldiers to a more complicated asparagus & Serrano ham and Manchego quiche, there are endless ways that you can use the asparagus spears. One of my favourite flavour combinations is in a simple starter that never fails to impress. 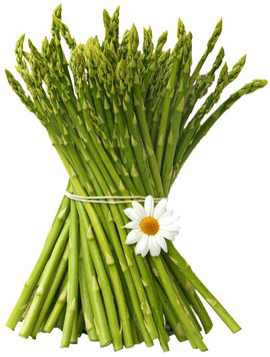 Prepare the asparagus by bending the stalk until it snaps. It will snap at a point where the spear is freshest. Blanche the spears in boiling water for 60 seconds, drain and refresh in iced water to preserve the colour and crunch. Dry the spears on some kitchen paper then set into 4 bundles of four spears. Lay the slices of Parma ham out on a piece of cling film, layer a bundle of asparagus on top of each before topping with a slice of the Feta. Roll the ham around to secure the Feta and asparagus. The tops and tails should be sticking out the top and bottom. If you want to get fancy, Blanche the dark outside from a spring onion, slice into long ribbons and tie each of the bundles with a bow, otherwise use a cocktail stick to keep them together in the oven. Place the bundles onto a baking tray and place into a preheated oven 180C for about 12-15 minutes. To serve, place two bundles onto a side plate with some dressed salad leaves. Drizzle with a good balsamic glaze. I use a chocolate balsamic that works really well with the strong flavours of the Feta and Parma ham. Strangely enough when we think of asparagus in the UK, we think of the green variety. 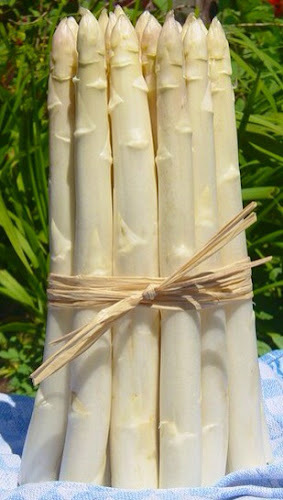 However across Europe when they talk about asparagus, they are specifically thinking of the white variety whilst green asparagus will be specified by the local language term. Compared to the latter, the locally cultivate so-called "white gold" or "edible ivory" and often referred to as 'the royal vegetable', is less bitter than the green variety and much more tender. In the UK, you are much more likely to see pre-cooked white asparagus in jars or tins. Next time in the supermarket or deli, pick up a jar and try it in a salad or use the white blanched stalks as a sandwich filling with ham and mustard. Make the most of the short season and get more asparagus into your food at home. If you're struggling for ideas, Click here for more recipes.